Gamma Knife is an advanced radiation treatment used for treating brain tumors and other disorders of brain such as arteriovenous malformation,trigeminal neuralgia.The radiosurgery system irradiates the tumor or the affected area with extreme precision while sparing the surrounding healthy tissue.It is a viable non invasive alternative to conventional brain surgery without the side effects that are normally associated with traditional brain surgery. Gamma knife is referred to as bloodless surgery for brain disorders. The treatment is carried out in a single session. Generally Outpatient procedure or sometimes overnight hospital stay may be required. Quick recovery and early resumption of normal activities. No need to cut open the skull to carry out the treatment. Prevents complications such as hemorrhage or infection, that may be associated with traditional neurosurgery, since there is no incision. Ideal for treating very small targets present deep in the brain and in sensitive areas. The cost of treatment with Gamma Knife is 25% to 30% cheaper than that of the conventional Neurosurgery. Works best for inoperable or complex tumors. 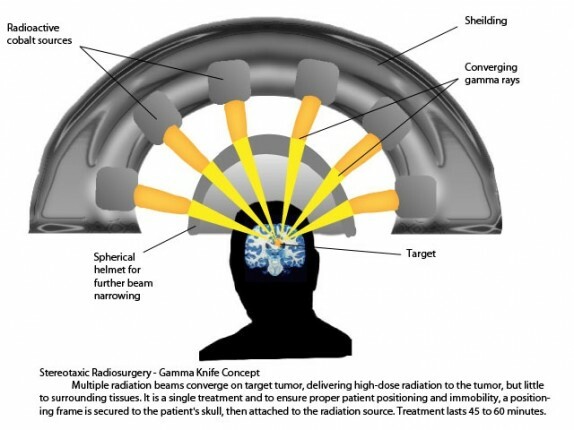 FDA approved radiation therapy for Brain Metastasis. Post surgery remaining tumor cells.